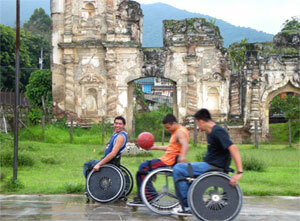 The Sports and Recreation initiative promotes active and healthy lifestyles by providing an athletic outlet for Guatemalans with disabilities. The program offers adaptive sports equipment, clinics by North American Paralympians, weekly basketball scrimmages, custom-made sports chairs for the women’s national basketball team, and country-wide tournament organization in collaboration with the Guatemalan government. Transitions’ athletes make up the majority of the Guatemalan national basketball team, the reigning Central America & the Caribbean champion, and act as regional leaders in the sport. Future expansion plans include the construction of a fully accessible training court and better organized wheelchair basketball league.